I had an exciting morning yesterday. 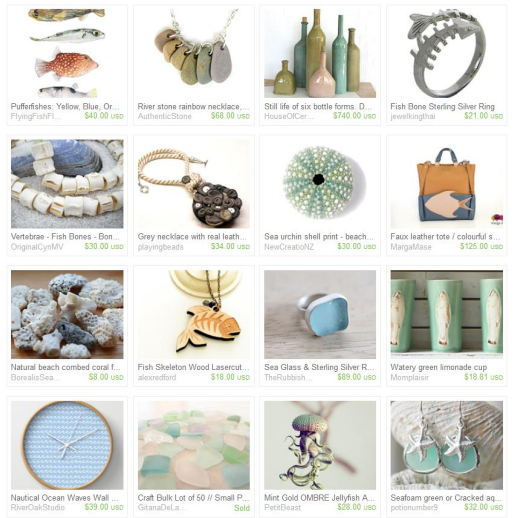 I woke up around 6am, compulsively logged into Etsy, and I realized that one of the treasuries I had curated was displayed on the front page of the website! For those who are not obsessed with everything about Etsy; a treasury is a collection of items from vendors on Etsy. Anybody with an Etsy account can make a treasury. A LOT of treasuries get made each day. Every hour the front page of Etsy's main website displays a different treasury. Having one of your items displayed on the front page is one of the ultimate awesome things that can happen for an Etsy seller, because your creation will get a TON of views (and hopefully sales) during that hour. Not every treasury makes it to the front page, and as a matter of fact most don't make it. While the treasury I created did not feature any of my items, it was still pretty amazing to see my picks on Etsy's main landing page. I'm pretty excited about all the fantastic items I featured in this particular treasury, so I wanted to share it here. Click on the picture to get a closer look at some of these beautiful things!